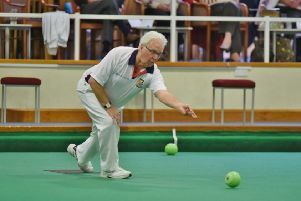 Fresh from winning the Bowls England national triples title with Parkway team-mates James Harford and Simon Law, Stuart Popple has been rewarded with an England senior trial later this month. Popple, a former junior international, has been chosen in a squad of 32, along with Warboys’ current international Tristan Morton, for the trial at Leamington on September 19. Eight players have already been pre-selected for next year’s international series in Wales, where England will be defending the British title, so only 16 places are available. Following Hunts’ success in the triples the previous weekend, county players couldn’t venture beyond the last 16 in the four-bowl singles, two-bowl singles and pairs during the final week of competition at Leamington. Former international Simon Leader (Warboys) toppled current England player John Rednall (Suffolk) 17-10 in the second round of the two-bowl singles, but went down 15-10 in the last 16 to Dorset’s Dave Smith. Popple, after his heroics in the triples, went down 16-15 in the preliminary round of the two-bowl singles to Yorkshire’s Paul Humphreys. Warboys pair Robert Elmore and Lewis Baker made it through to the last 16, where they were beaten 17-13 by Nottinghamshire’s Elliott Guthrie and Ben Powell, but Parkway’s Andrew Thurston and James Harford lost 19-11 in the second round to the Isle of Wight. In the four-bowl singles, Ed Elmore (Warboys) and James Bowers (Sawtry) lost in the opening round to Durham (21-18) and Warwickshire (21-7) respectively. Hunts junior women lost 45-33 to Somerset in their opening match in the Amy Rose double rink competition.